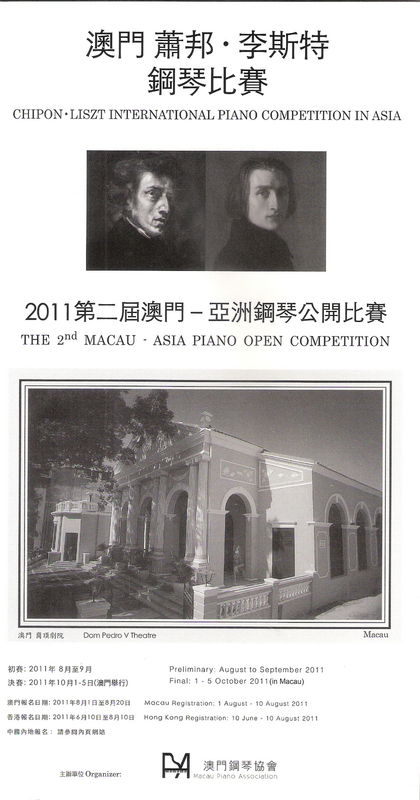 The Macau Piano Association sends me details of their forthcoming piano competition. In fact their information brochure talks of two separate competitions; the "2nd Macau-Asia Piano Open Competition" and the "Chipon-Liszt International Piano Competition in Asia". I have no idea what Chipon is. However, knowing the propensity for Chinese companies and organisations to get round infringements of international copyright by a slight misspelling of a famous name – I bought a calculator in rural China which, in design and logo looked very much like a Citizen, but on closer inspection was revealed to be a "Citiizen", and a very pretty young lady in a tight micro-handkerchief once sold me a genuine "Relox" watch last time I ventured into that rabbit warren of pirated goods which is Shenzhen) I suspect it is derived from the name of a famous Polish pianist/composer whose photograph adorns the flyers the Macau Piano Association has sent me about the competitions. I'm not sure why they bothered with this unsubtle deception. There are so many Chopin-Liszt Piano Competitions around nobody can seriously claim ownership of the brand name with any real hope of holding on to it in a court of law. It always amuses me, anyway, that these two composers are so often thrown together in the names of competition. From everything one reads of Chopin's piano playing and personality it seems he would have come a very close bottom in any piano competition in which he participated, while Liszt had such monumental arrogance, one can hardly imagine him subjecting himself to the scrutiny of a panel of judges all of whom he would no doubt have regarded as his intellectual, musical and spiritual inferior. The prospect of the two of them taking part together in any completion is, however, too tantalizing to ignore and, in my days of leisure, I'm tempted to draw up a little dramatic sketch in which Liszt and Chopin face off before a panel of judges drawn from spinster British piano teachers and American "pedagogues" (I put that in inverted commas since I am always vaguely amused by the propensity for humble piano teachers to elevate themselves with a half-understood term). But, not for the first time, I digress. There is a serious issue here, and that is the growth of competitions – especially piano ones – in recent years. My university days were spent in the unhealthy climate of Britain's last Socialist government (we laughed at the time that Harold Wilson, Jim Callaghan et al called themselves Socialists, but that was before the Appalling Blair came along with his completely screwed up notion of socialism – and everything else). This was the climate in which all forms of competition in education were deemed unhealthy; an age when nobody failed, they just achieved an "E" level pass – or to highlight the quaint bit of left-over socialism in the Trinity Guildhall ethos, "Below Pass" - we were told that competition was wrong, that to fail (or even come second) was a terminal blow to the educational and career opportunities for the young impressionable student which had to be avoided at all costs. Thus were sewn the seeds of Britain's elevation of the mediocre which persist to this day. After university I got involved in an organisation called, if my memory serves me correctly, the Association of British Competitive Music Festivals. It was an umbrella for a host of independent local music competitions which had been the backbone of Britain's proud history of music-making excellence for over a century. The word Competitive was quickly expunged, and those of us who served as adjudicators were told not to talk about winners or losers, not to issue marks and not to offer up from the stage comments which implied room for improvement among those whose performances were not flawless. The impression had to be given that everyone performing was brilliant and without fault and that every single one was equal in their ability. In short it negated wholesale the entire purpose of those hours' long sessions during which 107 under fives would play "Baa Baa Black Sheep" on their descant recorders. The children themselves, in their ignorance of socialist principles, wanted nothing more than to learn who had won and who had lost; but they never got their wish as superficial drivel was spouted out by adjudicators not all of whom had learnt the fine art of issuing coded messages under the guise of spineless platitudes. As a result I still have this somewhat jaundiced view of competitions. I have long argued that musical performance is by its very nature a competition. You have to compete with others to get on stage, you have to compete with others to get repeat bookings and you have to compete with others to get lucrative recording contracts. Yet, somewhere in the deep recesses of my mind, hangs that horrible 1970s mantra; "Competition is Bad". I've sat on more juries and adjudicating panels than I care to remember, and on every occasion I've been utterly convinced to the value of the work we do, yet the moment I opened the envelope from Macau and saw the flyers, I had that uneasy feeling that always comes over me when I learn of piano competitions (especially ones in which I have not been invited to serve as an adjudicator): Is it a good idea to turn musical performance into a competitive sport? The phenomenal success of the "Idol" and "X-Factor" franchises on world-wide television (franchises, ironically, born in Britain) have certainly not just legitimised competition in the eyes of the great mass of population, but have done wonders to improve consciousness of good and bad in performance. When a bad singer gets undue publicity for being bad, everyone knows it (even if they continue to buy his records), and when Simon Cowell utters his bilious comments, every music examiner and adjudicator feels a wave of satisfaction; "That's exactly what I'd have thought, even if I dared not say it". Some of the judges may possess breathtaking imbecility (one thinks of Piers Morgan and Paula Abdul), but nobody seems to question the validity of having those with undoubted professional experience sitting in judgement over those who have not (although Morgan's experience seems confined to escaping New international before phonehacking became a dirty word). It's been good for the pop music industry in demonstrating that musical and vocal skills are important, even if it's the pornographic video which sells the song to the uninitiated. Why shouldn't classical music jump on the bandwagon? And yet, and yet. Somewhere in my mind lurks that uncomfortable feeling that all these piano competitions don't really serve any purpose. Is not the musical world competition enough for the good to rise to the top and the mediocre to sink without trace? Do we really need more competitions to show us what we already know?